* IMPORTANT NOTE* The taxonomy of Corbicula species needs further revision. Therefore until then, in this database all identified species of the genus Corbicula collected in the United States are compiled under one name, Corbicula fluminea. Identification: A small light-colored bivalve with shell ornamented by distinct, concentric sulcations, anterior and posterior lateral teeth with many fine serrations. Dark shell morphs exist but are limited to the southwestern United States. The light-colored shell morph has a yellow-green to light brown periostracum and white to light blue or light purple nacre while the darker shell morph has a dark olive green to black periostracum and deep royal blue nacre (McMahon 1991). Qiu et al. (2001) reported yellow and brown shell color morphs among specimens collected from Sichuan Province in China. The shells of the yellow morphs were straw yellow on the outside and white on the inside; those of brown morphs were dark brown and purple, respectively. Further analyses revealed that the yellow and brown morphs are triploid and tetraploid, respectively. A separate clonal population of Corbicula has been reported for one location in the Illinois River (Tiemann et al 2017). Tentatively named Form D, this newest form is pyramidal in shape with weakly elevated ridges; exterior is yellowish-brown with fine rust colored rays radiating out from the umbo; interior is creamy white but the lateral teeth are purple. Form D has a distinctive nuclear ribosomal DNA genotype, but the mtDNA COI haplotype is identical to Form A. Native Range: The genus Corbicula lives in temperate to tropical southern Asia west to the eastern Mediterranean; Africa, except in the Sahara desert; and southeast Asian islands south into central and eastern Australia (Morton 1986). Table 1. States with nonindigenous occurrences, the earliest and latest observations in each state, and the tally and names of HUCs with observations†. Names and dates are hyperlinked to their relevant specimen records. The list of references for all nonindigenous occurrences of Corbicula fluminea are found here. Ecology: The Asian clam is a filter feeder that removes particles from the water column. It can be found at the sediment surface or slightly buried. Its ability to reproduce rapidly, coupled with low tolerance of cold temperatures (2-30°C), can produce wild swings in population sizes from year to year in northern water bodies. Both yellow and brown morphs are simultaneous hermaphrodites and brood their larvae in the inner demibranchs (Qiu et al. 2001). Furthermore, C. fluminea is able to reproduce by self-fertilization at different ploidy levels. The life span is about one to seven years. Means of Introduction: The first collection of C. fluminea in the United States occurred in 1938 along the banks of the Columbia River near Knappton, Washington (Counts 1986). Since this first introduction, it is now found in 46 states, the District of Columbia, and Puerto Rico. Corbicula fluminea was thought to enter the United States as a food item used by Chinese immigrants (Hanna 1966) but there is no direct evidence of that. Alternatively, it may have come in with the importation of the Giant Pacific oyster also from the Asia. The mechanism for dispersal within North America is unknown. It is known mostly as a biofouler of many electrical and nuclear power plants across the country. As water is drawn from rivers, streams, and reservoirs for cooling purposes so are Corbicula larvae. Once inside the plant, this mussel can clog condenser tubes, raw service water pipes, and firefighting equipment. Economic problems can result from the decreased efficiency of energy generation. Warm water effluents at these power plants make a hospitable environment for stabilizing populations. With man demonstrated to be the primary agent of dispersal, no large-scale geographic features function as dispersal barriers (Counts 1986, Isom 1986). Current methods of introduction include bait bucket introductions (Counts 1986), accidental introductions associated with imported aquaculture species (Counts 1986), and intentional introductions by people who buy them as a food item in markets (Devick 1991). The only other significant dispersal agent is thought to be passive movement via water currents (Isom 1986); fish and birds are not considered to be significant distribution vectors (Counts 1986, Isom 1986). Migrating blue catfish (Ictalurus furcatus) had shown the potential to pass live adults through their gut when the mussel was consumed and digested in cooler water (<21.1º C) (Gatlin et al. 2013). Status: Corbicula fluminea is established in river networks across many states as well as in Lake Erie, Lake Michigan, and Lake Superior (USEPA 2008). Environmental: The most prominent effect of the introduction of the Asian clam into the United States has been biofouling, especially of complex power plant and industrial water systems (Isom et al. 1986; Williams and McMahon 1986). It has also been documented to cause problems in irrigation canals and pipes (Prokopovich and Hebert 1965; Devick 1991) and drinking water supplies (Smith et al. 1979). It also alters benthic substrates (Sickel 1986), and competes with native species for limited resources (Devick 1991). Economic: In the USA, C. fluminea has caused millions of dollars worth of damage to intake pipes used in the power and water industries. Large numbers, either dead or alive, clog water intake pipes and the cost of removing them is estimated at about a billion US dollars each year (Anon., 2005). Juvenile C. fluminea get carried by water currents into condensers of electrical generating facilities where they attach themselves to the walls via byssus threads, growing and ultimately obstructing the flow of water. Several nuclear reactors have had to be closed down temporarily in the USA for the removal of Corbicula from the cooling systems (Isom, 1986). In Ohio and Tennessee where river beds are dredged for sand and gravel for use as aggregation material in cement, the high densities of C. fluminea have incorporated themselves in the cement, burrowing to the surface as the cement starts to set, weakening the structure (Sinclair and Isom, 1961). Isom (1986) has reviewed the invasion of C. fluminea of the Americas and the biofouling of its waters and industries. Ecological: C. fluminea is consumed mainly by fish and crayfish. An account of the different species which prey on C. fluminea in the USA is given by McMahon (1983). Garcia and Protogino (2005) describe the diet of some native fishes from Argentina (Rio de la Plata) previously not known to feed on C. fluminea. Their results indicate that several local fish species have modified their diet to feed on invasive molluscan species such as C. fluminea. Remarks: Factors that may affect population density and distribution of Asian clams include excessively high or low temperatures, salinity, drying, low pH, silt, hypoxia, pollution, bacterial, viral and parasitic infections, inter- and intraspecific competition, predators, and genetic changes (Evans et al. 1979, Sickel 1986). This clam has been found in the stomachs of black buffalo - Ictiobus niger (Minckley 1973); carp - Cyprinus carpio, channel catfish - Ictalurus punctatus, yellow bullhead - Ameiurus natalis, redear sunfish - Lepomis microlophus, largemouth bass - Micropterus salmoides, Mozambique tilapia - Tilapia mossambica (Minckley 1982); blue catfish - Ictalurus furcatus (M. Moser pers. comm. 1996; Gatlin et al. 2013); and spotted catfish - Ameiurus serracanthus (A. Foster pers. comm. 1996). Other predators of Corbicula include birds, raccoons, crayfish, and flatworms (Sickel 1986). Densities of C. fluminea have also been documented to occur by the thousands per square meter, often dominating the benthic community (Sickel 1986). Atkinson, C.L., S.P. Opsahl, A.P. Covich, S.W. Golladay, and L.M. Connor. 2010. Stable isotopic signatures, tissue stoichiometry, and nutrient cycling (C and N) of native and invasive freshwater bivalves. Journal of North American Benthological Society 29(2):496-505. Bear, B. - Wyoming Game and Fish Department, Cheyenne, WY. Burch, J.Q. 1944. Checklist of west American mollusks. Minutes, Conchological Club of Southern California 38:18. Clarke, A.H. 1981. Corbicula fluminea in Lake Erie. Nautilus 95:83-84. Clench, W.J. 1971. Corbicula manilensis Philippi in Oklahoma. Nautilus 85:145. Cohen, R.R.H., P.V. Dresler, E.J.P. Phillips, and R.L. Cory. 1984. The effect of the Asiatic clam, Corbicula fluminea, on phytoplankton of the Potomac River, Maryland. Limnology and Oceanography 29(1):170-180. Counts, C.L., III. 1985. 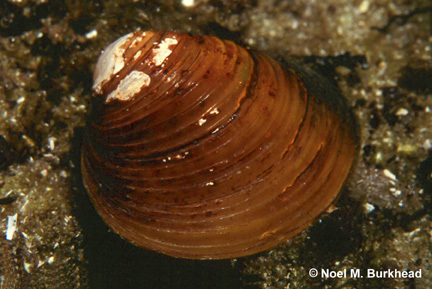 Corbicula fluminea (Bivalvia: Corbiculidae) in the state of Washington in 1937, and in Utah in 1978. Nautilus 99:18-19. Counts, C.L., III. 1986. The zoogeography and history of the invasion of the United States by Corbicula fluminea (Bivalvia: Corbiculidae). American Malacological Bulletin, Special Edition No. 2:7-39. Counts, C.L., III. 1991. Corbicula (Bivalvia: Corbiculidae). Tryonia: Miscellaneous Publications of the Department of Malacology, No. 21. The Academy of Natural Sciences of Philadelphia. 134pp. Cummings, S.E., and J.A. Jones. 1978. Occurrence of Corbicula manilensis Philippi (sic) in the lower Minnesota River. Journal of the Minnesota Academy of Science 34:13-14. Devick, W.S. 1991. Patterns of introductions of aquatic organisms to Hawaiian freshwater habitats. Pages 189-213 in New Directions in Research, Management and Conservation of Hawaiian Freshwater Stream Ecosystem. Proceedings Freshwater Stream Biology and Fisheries Management Symposium. Department of Land and Natural Resources, Division of Aquatic Resources, Honolulu, HI. Diaz, R.J. 1974. Asiatic clam, Corbicula manilensis (Philippi) in the tidal James River, Virginia. Chesapeake Science 15:118-120. Dressler, P.V., and R.L. Cory. 1980. The Asiatic clam, Corbicula fluminea (Müller), in the tidal Potomac River, Maryland. Estuaries 3:150-152. Dundee, D.S., and H.A. Dundee. 1958. Extension of known ranges of four Mollusca. Nautilus 72:51-53. Eckblad, J.W. 1975. The Asiatic clam, Corbicula, in the upper Mississippi River. Nautilus 89:4. Evans, L.P., Jr., C.E. Murphy, J.C. Britton, and L.W. Newland. 1979. Salinity relationships in Corbicula fluminea (Müller). Proceedings First International Corbicula Symposium. Texas Christian University Research Foundation, pp. 194-214. Fetchner, F.K. 1962. Corbicula fluminea (Müller) from the Ohio River. Nautilus 75:126. Foster, A. - U.S. Geological Survey, Gainesville, Florida. Fox, R.O. 1969. The Corbicula story: a progress report. Second Annual Meeting, Western Society of Malacologists. 11 pp. Fox, R.O. 1970. The Corbicula story: chapter two. Third Annual Meeting, Western Society of Malacologists. 10 pp. Fox, R.O. 1971. The Corbicula story: chapter three. Fourth Annual Meeting, Western Society of Malacologists. 5 pp. Fuller, S.L.H., and C.E. Powell. 1973. Range extension of Corbicula manilensis (Philippi) in the Atlantic drainage of the United States. Nautilus 87:59. Garcia, M.L., and L.C. Protogino. 2005. Invasive freshwater mollusks are consumed by native fishes in South America. Journal of Applied Ichthyology 21: 34-38. Gatlin, M. R., Shoup, D. E., and J. M. Long. 2013. Invasive zebra mussels (Driessena polymorpha) and Asian clams (Corbicula fluminea) survive gut passage of migratory fish species: implications for dispersal. Biological Invasions 15:1195-1200. DOI 10.1007/s10530-012-0372-0. Hakenkamp, C.C., and M.A. Palmer. 1999. Introduced bivalves in freshwater ecosystems: the impact of Corbicula on organic matter dynamics in a sandy stream. Oecologia 119(3):445-451. Hanna, G.D. 1966. Introduced mollusks of western North America. California Academy of Sciences Occasional Papers 48:1-108. Hartenstine, R. – Rhode Island College, Providence, RI. Heard, W.H. 1964. Corbicula fluminea in Florida. Nautilus 77:105-107. Heard, W.H. 1966. Further records of Corbicula fluminea (Müller) in the southern United States. Nautilus 79:105-107. Henninger, H. 2013. The Asian clam, Corbicula fluminea: a brief review of the scientific literature. Accessed 12/12/ 2013. Herron, E. – University of Rhode Island, Kingston, RI. Hubricht, L. 1963. Corbicula fluminea in the Mobile River. Nautilus 77:31. Ingram, W.H. 1948. The larger freshwater clams of California, Oregon and Washington. Journal of Entomology and Zoology 40:72-92. Ingram, W.H. 1959. Asiatic clams as potential pests in California water supplies. Journal of the American Water Works Association 51:363-370. Isom, B.G. 1986. Historical review of Asiatic clam (Corbicula) invasion and biofouling of waters and industries in the Americas. American Malacological Bulletin, Special Edition No. 2:1-5. Isom, B.G., C.F. Bowman, J.T. Johnson, and E.B. Rodgers. 1986. Controlling Corbicula (Asiatic clams) in complex power plant and industrial water systems. American Malacological Bulletin, Special Edition 2:95-98. Karatayev, A.Y., L.E. Burlakova, and D.K. Padilla. 2005. Contrasting distribution and impacts of two freshwater exotic suspension feeders, Dreissena polymorpha and Corbicula fluminea. In Dame, R. and S. Olenin (Eds.). The Comparative Roles of Suspension Feeders in Ecosystems. NATO Science Series: IV – Earth and Environmental Sciences, pp. 239-262. Karns, B., G. Plotz, P. Short, and 16 others. 2004. Results of 2004 monitoring of freshwater mussel communities of the Saint Croix National Scenic Riverway, Minnesota and Wisconsin. Wisconsin Department of Natural Resources, La Crosse, WI. 21 pp. Lauritsen, D.D., and S.C. Mozley. 1989. Nutrient excretion by the Asiatic clam Corbicula fluminea. Journal of the North American Benthological Society 8(2):134-139. Mackie, G.L., and D.G. Huggins. 1983. Sphaeriacean clams of Kansas. Technical Publications of the State Biological Survey of Kansas, University of Kansas, Lawrence. 92 pp. McMahon, R.F. 1983. Ecology of an invasive pest bivalve, Corbicula. In W.D. Russell-Hunter (ed. ), The Mollusca, Vol. Ecology, Academic Press, NY, pp. 505-561. McMahon, R. 1991. Mollusca: Bivalvia. Pp 315-399 in J.H. Thorp and A.P. Covich. (eds.) Ecology and Classification of North American Freshwater Invertebrates. Academic Press, Inc., New York. 911pp. McMahon, R.F. 2000. Invasive characteristics of the freshwater bivalve Corbicula fluminea. In R. Claudi and J. Leach (eds.) Nonindigenous Freshwater Organisms: Vectors, Biology and Impacts. Lewis Publishers, Boca Raton, FL, pp 315–343. Metcalf, A.L. 1966. Corbicula manilensis in the Mesilla Valley of Texas and New Mexico. Nautilus 80:16-20. Minckley, W.L. 1982. Trophic interrelations among introduced fishes in the lower Colorado River, southwestern United States. California Fish and Game 68:78-89. Morgan, D.E. – Millstone Environmental Laboratory, Dominion Nuclear Connecticut, Inc., Waterford, CT.
Morton, B. 1986. Corbicula in Asia - an updated synthesis. American Malacological Bulletin, Special Edition No. 2:113-124. Moser, M. - Center for Marine Science Research, Wilmington, North Carolina. Nelson, S.M., and C. McNabb. 1994. New record of Asian clam in Colorado. Journal of Freshwater Ecology 9(1):79. Peyton, M.M., and J.L. Maher. 1995. A survey of mussels (Mollusca: Bivalvia) in the Platte River system and associated irrigation and hydropower canal and lake systems west of Overton, Nebraska. Transactions of the Nebraska Academy of Sciences 22:43-48. Phelps, H.L. 1994. The Asiatic clam (Corbicula fluminea) invasion and system-level ecological change in the Potomac River Estuary near Washington, DC. Estuaries 17(3):614-621. Pimentel, D., L. Lach, R. Zuniga, and D. Morrison. 2000. Environmental and economic costs of nonindigenous species in the United States. BioScience 50(1):53-65. Pojeta, J. 1964. Notes on the extension of the known range of the Asiatic clam Corbicula fluminea (Müller) in Ohio River. Ohio Journal of Science 64:428. Prokopovich, N.P., and D.J. Hebert. 1965. Sedimentation in the Delta-Mendota Canal. Journal of the American Water Works Association 57:375-382. Qiu, A., A. Shi, and A. Komaru. 2001. Yellow and brown shell color morphs of Corbicula fluminea (Bivalvia: Corbiculidae) from Sichuan Province, China, are triploids and tetraploids. Journal of Shellfish Research 20: 323-328. Raeihle, D. 1983. Corbicula fluminea (Müller, 1774) in Massapequa Lake, Long Island, New York. New York Shell Club Notes 28:9-10. Ruiz, G.M., P.W. Fofonoff, J.T. Carlton, M.J. Wonham, and A.H. Hines. 2000. Invasion of coastal marine communities in North America: apparent patterns, processes, and biases. Annual Review of Ecological Systematics 31:481-531. Sickel, J.B. 1973. New record of Corbicula manilensis (Philippi) in the southern Atlantic slope region of Georgia. Nautilus 87:11-12. Sickel, J.B. 1986. Corbicula population mortalities: factors influencing population control. American Malacological Bulletin, Special Edition 2:89-94. Silverman, H., S.J. Nichols, J.S. Cherry, E. Achberger, J.W. Lynn, and T.H. Dietz. 1997. Clearance of laboratory-cultured bacteria by freshwater bivalves: difference between lentic and lotic unionids. Canadian Journal of Zoology 75(11):1857-1866. Sinclair, R.M., and B.G. Isom. 1961. A preliminary report on the introduced Asiatic clam Corbicula in Tennessee. Tennessee Stream Pollution Control Board, Tennessee Department of Public Health. 31 pp. Smagula, A. - New Hampshire Department of Environmental Services, Concord, NH. Smith, A.L., A. Mula, J.P. Farkas, and D.O. Bassett. 1979. Clams - a growing threat to inplant water systems. Plant Engineering 1979:165-167. Sousa, R., L. Guilhermino, and C. Antunes. 2005. Molluscan fauna in the freshwater tidal area of the River Minho estuary, NW of Iberian Peninsula. International Journal of Limnology 41(2): 141-147. Sousa, R., A.J.A. Nogueira, M.B. Gaspar, C. Antunes, and L. Guilhermino. 2008. Growth and extremely high production of the non-indigenous invasive species Corbicula fluminea (Muller, 1774): Possible implications for ecosystem functioning. Estuarine, Coastal, and Shelf Science 80: 289-295. Stein, C.B. 1962. An extension of the known range of the Asiatic clam, Corbicula fluminea (Müller), in the Ohio and Mississippi Rivers. Ohio Journal of Science 62:326-327. Stotts, V. D., K. D'Loughy, and D. B. Stotts. 1977. Waterfowl habitat. Maryland Department of Natural Resources Wildlife Administration Report 77-2. 6 pp. Strayer, D.L. 1999. Effects of alien species on freshwater mollusks in North America. Journal of the North American Benthological Society 18(1):74-98. Takabe, Y., H. Tsuno, F. Nishimura, Y. Guan, T. Mizuno, C. Matsumura, and T. Nakano. 2011. Applicability of Corbicula as a bioindicator for monitoring organochlorine pesticides in fresh and brackish waters. Environmental Monitoring and Assessment 179(1-4): 47-63. Thomas, N.A., and K.M. MacKenthum. 1964. Asiatic clam infestation at Charleston, West Virginia. Nautilus 78:28-29. Tiemann, J.S., A.E. Haponski, S.A. Douglass, T. Lee, K.S. Cummings, M.A. Davis and D. Ó Foighil. 2017. First record of a putative novel invasive Corbicula lineage discovered in the Illinois River, Illinois, USA. BioInvasions Records 6(2): 159–166. Trebitz, A.S., C.W. West, J.C. Hoffman, J.R. Kelly, G.S. Peterson, and I.A. Grigorovich. 2010. Status of non-indigenous benthic invertebrates in the Duluth-Superior Harbor and the role of sampling methods in their detection. Journal of Great Lakes Research 36(4):747-756. Vaughn, C.C., and C.C. Hakenkamp. 2001. The functional role of burrowing bivalves in freshwater ecosystems. Freshwater Biology 46(11):1431-1446. Vohmann, A., J. Borcherding, A. Kureck, A. Hij de Vatte, H. Arndt, and M. Weitere. 2010. Strong body mass decrease of the invasive clam Corbicula fluminea during summer. Biological Invasions 12: 53-64. Werner. S., and K. Rothhaupt. 2008. Effects of the invasive Asian clam Corbicula fluminea on benthic macroinvertebrate taxa in laboratory experiments. Fundamental and Applied Limnology 173(2):145-152. Williams, C.J., and R.F. McMahon. 1986. Power station entrainment of Corbicula fluminea (Müller) in relation to population dynamics, reproductive cycle and biotic and abiotic variables. American Malacological Bulletin, Special Edition 2:99-111. Wittmann, M.E., S. Chandra, J.E. Reuter, S.G. Schladow, B.C. Allen, and K.J. Webb. 2012. The control of an invasive bivalve, Corbicula fluminea, using gas impermeable benthic barriers in a large natural lake. Environmental Management 49(6):1163-73. Zhang, L., Q. Shen, H. Hu, S. Shao, and C. Fan. 2011. Impacts of Corbicula fluminea on oxygen uptake and nutrient fluxes across the sediment-water interface. Water, Air, and Soil Pollution 220(1-4):399-411. Author: Foster, A.M., Fuller, P., Benson, A., Constant, S., Raikow, D., Larson, J., and Fusaro, A.